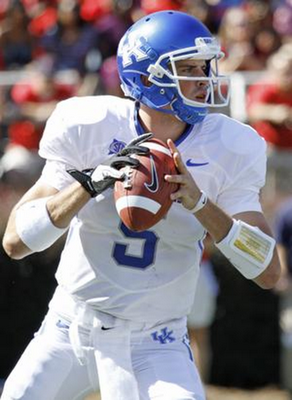 Kentucky quarterback Mike Hartline looks down field during an Oct. 2, 2010, game against Mississippi in Oxford, Miss. Hartline's quarterbacks coach and offensive coordinator at Kentucky thinks he has what it takes to make it in the NFL. It was just after 10 Tuesday morning when Mike Hartline started wondering about his NFL future. The former GlenOak High School star quarterback started seeing other undrafted free agents signing with NFL teams a day after the lockout ended. Within three hours — 12:31 p.m. to be exact — Hartline couldn’t believe his good fortune. He was going to sign with the Indianapolis Colts, meaning he has a chance to back up superstar Peyton Manning. “At first it was pretty shocking,” said Hartline, a starter the past three years at the University of Kentucky. “... To get something like this to be offered to you is pretty crazy. It’s a guy you’ve looked up to most of your whole life. Hartline will get his playbook and equipment today at Colts’ training camp, he will go to film sessions and study in a classroom. The business of being a professional football player begins. The Colts have two returning quarterbacks. Curtis Painter, a 2009 sixth-round pick out of Purdue is the other. They also signed former Ball State quarterback Nate Davis, who has spent two seasons in the NFL. The 6-foot-6, 210-pound Hartline left Kentucky ranked fourth in career passing yards (5,680) and fifth in career touchdown passes (38). He threw for 3,178 yards last season with 23 TDs and just nine interceptions in 405 attempts. Hartline hoped to get drafted, but when he didn’t, he kept working hard. He made two trips to Florida to work out with his older brother, Brian, a receiver with the Dolphins. Mike wanted to be ready once the lockout ended. Late Tuesday morning was when Hartline started getting anxious. He was back in Lexington, Ky. after spending time back home. It was about noon when he finally texted his agent, Neil Cornrich, for news. “He’d just got off the phone with the Colts and said he was talking to them about me and trying to get me there. He called me back in half an hour and by this time, the deal was done. Soon he was making the 3 1/2-hour trip to Indianapolis to begin his pro career.